My passion for agriculture started in high school, while growing up on a family farm and becoming active in the National FFA Organization. Since then, I have taken advantage of as many educational opportunities as possible, in order to become knowledgeable in the field of agriculture. Currently, my education continues at the University of Wisconsin–Madison where I plan to earn a Master’s Degree in Weed Science from the Department of Agronomy. Atrazine is an herbicide that can be applied preemergence or postemergence in corn to control broadleaf weeds and some grass species. After decades of use, farmers continue to utilize atrazine because of its agronomic and economic benefits. Like all pesticides, atrazine use has benefits and risks. The risks include surface and groundwater contamination, which have caused local and National concern. Weed management strategies have changed dramatically since the beginning of atrazine use. Reliance on glyphosate as a main source of weed control, as well as a decrease in the integration of residual herbicides, tillage, and crop rotation for weed management, has resulted in a dramatic increase in the number of glyphosate-resistant weeds. Atrazine differs from glyphosate in its mode-of-action, and can therefore provide another tool for generating a glyphosate resistance weed management strategy. Conduct an online survey of crop history, herbicide use, and tillage practices. 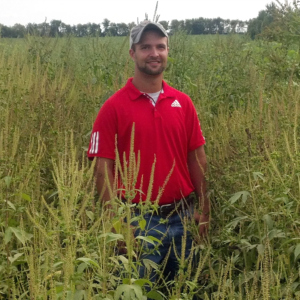 Follow up the on-line survey with an in-field survey of late-season weed escapes in corn and soybean fields throughout Wisconsin. Calculate weed species frequency, density, uniformity, and richness and make comparisons between categories of crop, tillage, region, and atrazine use history. Furthermore, collect seed from weed populations that cause suspicion of glyphosate resistance and then screen the populations for glyphosate resistance in the greenhouse. Conduct small plot field experiments in corn at multiple sites and years. Apply reduced rates of atrazine both PRE and POST in combination with a POST program of glyphosate, glufosinate, or tembotrione. Estimate weed control regularly throughout the growing season, measure weed heights and population densities prior to POST applications and prior to corn harvest, and harvest corn. Subject data to ANOVA and separate means using Fisher’s Protected LSD. Compare treatments using preplanned contrasts.